Zoom Whitening: How Does It Work? With little sacrifice of your time and money, Zoom Whitening can give you dramatic results and numerous benefits towards a brighter, more confident smile. 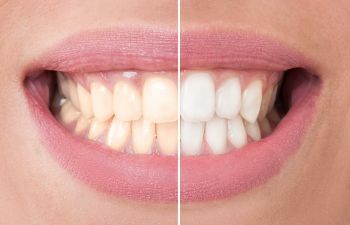 While avoiding stain-causing foods and drinks and maintaining diligent oral hygiene are the most practical steps towards whiter teeth, many patients want to erase stains and boost their smile appearance in a quicker timeframe. Zoom whitening is an in-office bleaching treatment that can be completed in about one hour. How many shades lighter can Zoom take your smile? This varies from patient to patient, as Zoom results are based on the level of existing discoloration and type of tooth stains. In general, Zoom Whitening can lighten your smile six to ten shades! What can you expect when you go in for your Zoom visit? You’ll rest comfortably in the dental chair just as you would during your normal dental exam. The Zoom Advanced Power Chairside Lamp will be brought to you. This is a special UV light that activates the Zoom whitening gel to accelerates the bleaching process. Your teeth will be polished with Zoom whitening gel, which contains 25 percent hydrogen peroxide. Your teeth will be comfortably isolated so that your lips and gums are protected throughout the treatment session. You will even be given special glasses (much like sunglasses) to wear to protect your eyes. The Zoom treatment involves three 15-minute sessions that begin with an application of whitening gel. During each session, the Zoom light triggers a breakdown of the hydrogen peroxide on your teeth. This allows more oxygen to penetrate the enamel and dentin layers of your teeth, which essentially bleaches any existing stains. Rest assured that the structure of the tooth is completely preserved during treatment. Zoom products are proven and safe. Besides some mild and temporary sensitivity, you shouldn’t experience any side effects from Zoom whitening. Choosing a dentist to whiten your teeth offers invaluable benefits. Not only is your safety and smile health protected at every step, but your results will also be customized to your specific needs. In addition, Zoom whitening includes a set of custom trays and take-home whitening gel so that you can touch up your results as needed. Remember that you can extend the longevity of your whitening results by avoiding staining culprits, such as smoking, coffee, red wine, etc. Want to learn more about how easy it is to gain a whiter smile? Contact Mitzi Morris, DMD. We offer a full menu of cosmetic dental services designed to fit your budget and maximize your smile confidence.